‘What am I looking at?’ There are different kinds of object in this show – from David Chalkley’s conceptual piece, a photocopied version of Eduardo Paolozzi’s ‘Lost Magic Kingdoms in the Age of Mechanical Reproduction’………. to Pat Savage’s, the Mere, an illustration based upon Seamus Heaney’s translation of Beowulf, and all positions in between with a detour through sound. The sheer variety of works brought together under the umbrella proposal for artists to ‘..submit work to the gallery which interpreted a book of their choice. artwork in this exhibition explores how the written word is translated and represented in visual language and how narrative inspires the visual artist.‘ is a little daunting. 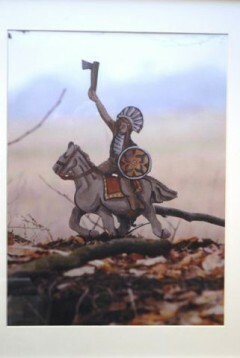 Rob Turner shows photographs of wooden models of North American ‘Indians’ set in the woods, an echo of his childhood admiration for the native over the cowboy. Immediately they display pure pleasure in making as playing, playing as making,- art object as toy. By way of contrast Ruth Dent’s abstract floor piece connects with music through quotations from Virginia Woolf’s ‘The Voyage Out’ Being so different one from another, the absorption of artists in subject-matter seems intensified. Closely connected to ideas of illustration and fine art, are those of ornament and decoration. 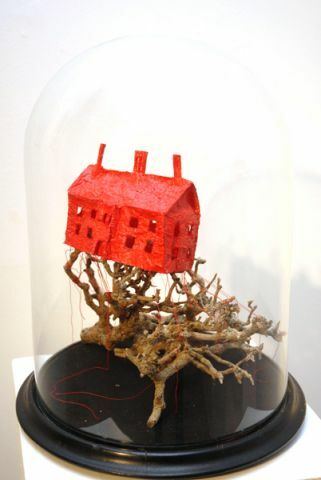 Qualities whose boundaries and meanings cannot be taken for granted, they neverhteless are hinted at in ‘The Little Red House’ by Sara Wicks, and in Juliet Simpson’s ‘The Little Wooden Horse’ Across the gallery, Ed Boxall delves into ‘The Wind Among the Reeds’ WB Yeats‘ ‘…exquisite portrayal of love and longing…’ . 15 small images are fixed roughly to the wall with brass panel pins in an approximately 2ft x 3ft grid formation. Edges are soft and uneven tentatively cut from hardboard sheet. The manner of execution too is quiet, like incomplete, working thoughts, works in progress that occur, to be returned to. Louisa Crispin prints the uninked etching plate of stinging nettles – uninked perhaps to illustrate loss of habitat and decline of butterfly populations, and then draws the butterflies (back ?) into the image in pencil. They are pinned to their mounts behind glass much like museum specimens. Niki Campbell’s piece ‘Maiden Names’ consists of three parts, an online space where women may offer their own premarital stories, a small booklet of 40 of the stories,and a display case containing small personal objects submerged in wax so that they can be seen but with difficulty, like the maiden name that is submerged under the weights of convention, below the surface of marriage, an echo of Miss Skynner’s, last words on page 40 of the booklet ‘….I miss my name.’ Julian Rowe uses a similar device of semi-concealment. The modern Prometheus based upon his Reading of Mary Shelley’s ‘Frankenstein or The modern Prometheus’, is a cabinet of sorts constructed in hinged tryptich form with an image of mountain terrain, small cast blocks depicting pack-ice, and a reference to arctic explorers, Shackleton perhaps, in the form of a ship trapped and capsizing on the ice. Rusty chicken wire is just visible through a glass front whose transparency is disfigured by copper coloured staining.On a small digital screen, an Edweard Muybridge naked man faces his mirror image whilst both walk on the spot. The spirit of Caspar David Friedrich infuses the piece. Christine Gist’s installation ‘..inspired by the compelling images evoked by Cormac McCarthy’s ‘The Road’ consisting of a soft-blue painted shelf, dried twigs, deep – magenta dry roses, offcuts of glass, plaited string potted primulas (later exchanged for potted cacti) feels compositionally like a painting – verticals and horizontals with about 6 inches of depth. Claire Beattie deceives us with fired ceramic painted to look unfired and fragile. The piece is tougher than it looks. 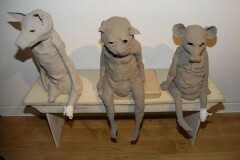 Her three figures seated on a waiting-room bench, look at first like characters from a children’s story, but with a painful twist – two have been injured, one missing a foot, the other the lower half of its left leg. There is no choice but to wait. Trains, like hope and disappointment, will come and go indefinitely. The middle character sits on a brown-paper wrapped parcel, perhaps W. G. Sebald’s ‘The Waiting Room’, inspiration for the piece. Laura Broad’s piece reconstitutes the Bible, in a manner of speaking, maybe a manner of speaking in visual tongues. 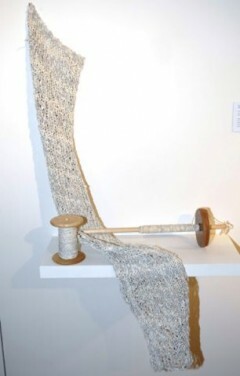 She spins the pages of an old damaged bible into paper yarn. Words no longer lay next to each other on the page. Twisted and turned, spun and knitted their past meanings go the way of the maiden name. Amanda Thompson’s painting at first sight is essentially an abstract image, but are those shapes organisms, the viruses of the title ‘Virus No 1’? Reading the exhibition blurb, we find Irit Rogoff ‘s book ‘Terra Firma – Geographies Visual Culture’ contributing to Thompson’s research. Rogof is Professor of Visual Culture at Goldsmith’s College.Thompson’s concerns in this ‘viral’ piece are with boundaries echoing, notions of displacement and identity.Lynne Bingham’s piece, ‘Widow and Mother’ appropriates an old copy of ‘Vanity Fair’ by William Thackeray. The widow’s past is represented in the open book by pages buttoned together, into which a recess resembling a shallow grave is cut. In it lies a lacemaker’s bobbin. The pages of the future, prefaced with a framed photograph of the widow and her son, remain to be turned. Jane Pitt’s sound piece hints at fear through animal sounds, laughter, the breathing of somebody running? The use of headphones seems not to do justice to the spatial implications of this piece. A gallery setting in which the sound cannot form around us, reduces the experience. An tint of loss and nostalgia infuses the show. 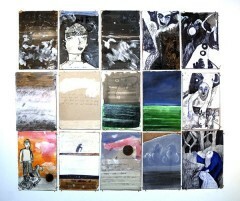 Rob turner’s pieces reach out to childhood innocence and the myth of the innocent savage, whilst Niki Campbell’s engagement with the maiden name as well as having a real and compelling connection with independent selves looks over the shoulder to a time of innocence prior to the corrupting embrace. ‘The Little Wooden Horse’ of the title, vulnerable and innocent, about to be engulfed by white horses of an oceanic kind waits in ignorance. What is it that compels in the knitting of words, but a sense of loss? And what yearning might Lynne Bingham’s widow and her son have felt that past pages could be re-turned? The theme reverberates anew through the overturned birdnest in Sara Wickes’ ‘Robin Shoes’. Breughel’s Icarus illustrates that tragedy is simultaneously universal and local; the farmer continues along his own furrow.